Project reference group member Simon Hemming, architects Paul Katsieris and Sara Jackson and Latrobe City mayor at the site of the new performing arts centre. Photograph Hayley Mills. Image courtesy of Latrobe Valley Express. 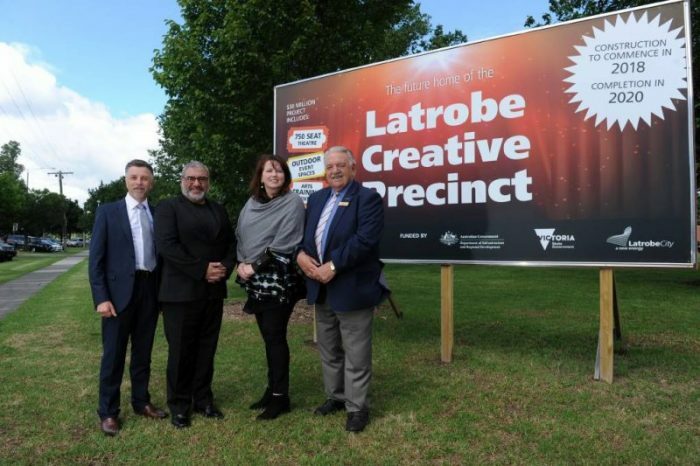 Coming off the back of a very successful Bunjil Place, Meinhardt is delighted to be a part of yet another creative hub for regional Victoria. Our congratulations go out to Jackson Architecture in association with Katsieris Origami Architecture, who have been appointed as the designers for the project. The state of the art development will encompass a minimum 750 seat theatre, a studio theatre, multipurpose rooms, a café and outdoor event spaces. Site works are expected to commence in late 2018. For more information, read the full release from Latrobe City Council.